More than anything else Ridley Scott’s directing debut, The Duellists, tells the story of an obsession. I’m glad Guy (Phoenix Cinema) suggested it as I wasn’t aware of the movie and found it oddly captivating and very beautiful too. Plus I find duels fascinating. I can’t really say why. 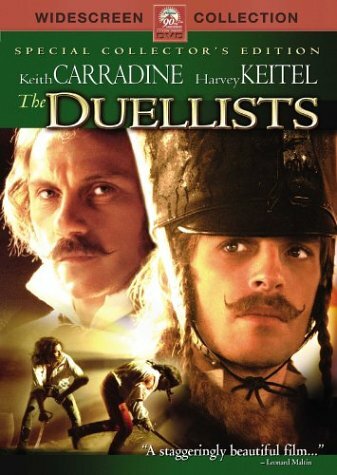 Based on the short story The Duel by Joseph Conrad The Duellists tells the story of a lifelong enmity. Two officers of Napoleon’s army, d’Hubert (Keith Carradine) and Feraud (Harvey Keitel), pursue each other for years and fight one duel after the other. While the first duel might have made some sense, at least at the time, the following duels are less and less understandable. Although d’Hubert tries to reason with Feraud, the latter becomes more and more obsessed as the years pass by. The movie has a lot more to offer than a fascinating story and two interesting characters. It’s visually stunning and brilliantly acted. I couldn’t even say which of the two actors I liked better. Carradine as d’Hubert who seems more complex, more humane or Keitel as Feraud who is relentless in his pursuit of d’Hubert. If you like sword fighting you will adore The Duellists anyway as the choreography of the fights, as many reviewers have commented, is excellent. The movie starts in 1800 and ends around 1815. 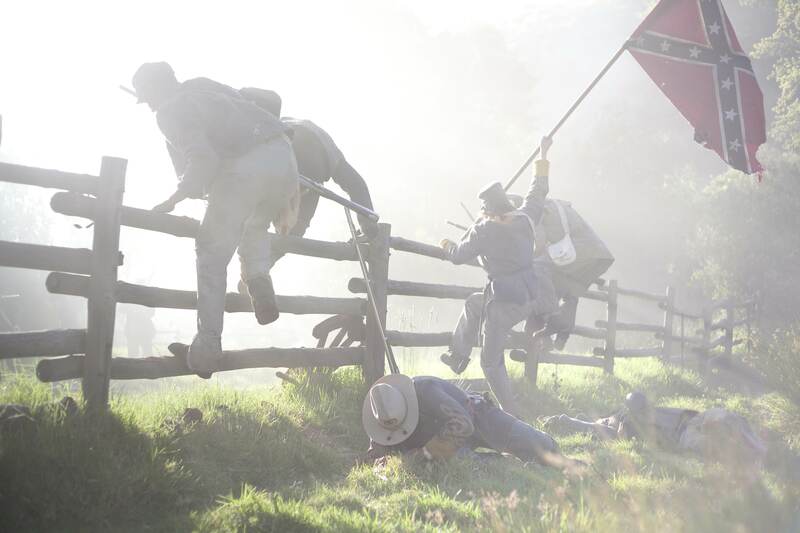 After almost every duel the men lose sight of each other for a few months or even years as they are often posted in other places. They sometimes meet under quite improbable circumstances, once for example while retreating from Moscow where they fight a group of Cossacks together. The code of duels was quite complex, I suppose every country had its own set of rules. I felt we learned quite a lot about the rules in France at the time. What made it especially dramatic was the fact that if one of them had been promoted but not the other one it would have become impossible to go on fighting. So every time d’Hubert is promoted he hopes the folly is about to end, only to find out later that Feraud meanwhile has been promoted to the same rank. The Duellists has been compared to Barry Lyndon but I don’t think they are that similar. Be it as it may, I’ feel more inclined to rewatch The Duellists, I thought it was more captivating. And I really must read the novella soon. This is the second time I have watched Kingdom of Heaven. The first time I watched it on a tiny TV and thought that may have been the reason why it didn’t work for me. A few years later and with a big screen and a good sound system it still didn’t work. And this despite the fact that it is a Ridley Scott movie, the cinematography is stunning, the music – Hans Zimmer Harry Gregson-Williams – is good and…. That’s it. … There is nothing else I can add to the plus side. OK, maybe the battle scene towards the end which seems to be one of the Top 10 battle scenes of all time. It’s good, yes, but after 2 straight hours of utter boredom, it’s hard to redevelop some sort of enthusiasm. Balian (Orlando Bloom), a blacksmith, travels to Jerusalem with his father, Godfrey de Ibelin (Liam Neeson). Ibelin dies on the way but Balian travels on. The movie is set during the reign of Baldwin IV, the so-called leper king (Edward Norton behind a mask). During his reign, Jerusalem is a Kingdom of Heaven in which Christians and Muslims live together in peace. After Baldwin’s death, the husband of Baldwin’s sister becomes king. He wants Jerusalem to be Christian. He attacks Saladin’s army but loses the battle and Saladin marches towards Jerusalem where Balian heads the army that stayed behind. After the final epic battle is lost, Balian leads the people out of the city while Saladin and his people take over. This is more or less the core of the story. The story. Why do we need the side story of someone going back to get his illegitimate son and fight along with him? This story part adds at least half an hour to a movie that would have needed some serious cutting plus a main character who totally lacks charisma. The length. It is way too long. I was bored after the first 25 minutes, yet had to suffer through another 2hrs. The actors. Orlando Bloom is not a good actor. No amount of make-up will ever make him one. Eva Green is one of those actresses you see and forget the moment the camera isn’t on her anymore. Not exactly a fascinating couple. While some of the other actors are very good, their combinations makes the choices look very random. The cinematography. It’s stunning, as I said in the beginning, but if that’s the only thing a movie has to offer it becomes annoying. “One more bluish picture and I scream”, was what I was thinking. The characters. Even if the main character had been played by someone else, it would still have been a very boring character. In his only strong moment, when he frees the slaves and decides to defend the city against all odds, he sounds like a parakeet and mimics his late father. As Orlando Bloom is a bad actor, it sounds as if he was reciting a badly learned text. The history. It isn’t accurate or rather it seems a hodgepodge of historical elements. All in all it is too bad as the movie had potential. If you would like to see a really great movie on the Crusades, watch Arn – The Knight Templar instead. On the weekend I finally watched Gladiator again and on BluRay. I’m still sometimes reluctant to buy BluRays but in this case it was really worth it. It was almost another movie. The sound was great, the colors intense. Quite amazing. Is Gladiator a war movie? I don’t think so, I don’t think King Arthur or Last of the Mohicans are war movies, but they are certainly war themed. If I did consider them to be real war movies… My Top 10 would look slightly different. Although I don’t like Gladiator as much as King Arthur, I still like it a lot. I have a feeling however that this is a movie that is so widely known that reviewing it in detail makes no sense. Just let me tell you that it starts with an intense battle in Germania. The Roman Empire is hungry for land and advancing greedily and brutally. After the battle is won the old emperor has a heart to heart with his General Maximus (Russell Crowe). He doesn’t want his own son Commodus (Joaquin Phoenix) to become emperor after his death, he wants to re-establish the Senate, give Rome back to the people. If Maximus was in charge it could be done. Things don’t quite turn out that way. Commodus speeds up his father’s passing and wants Maximus killed. Maximus wouldn’t be the hero he already is, if he couldn’t overcome the men in charge of killing him. He escapes and returns to Italy to find his family slaughtered. Badly wounded he faints, is picked up by a slave merchant and sold to become a gladiator. That’s the beginning. Fight upon fight follows, until the gladiators finally arrive at the place of their destination, the Colosseum in Rome. The new motto of the new emperorCommodus is “Bread and Games” and the best of the best of the Gladiators have to fight in the huge arena. What happens when Commodus finds out Maximus isn’t dead… is for you to find out. If you haven’t done so already, watch it. 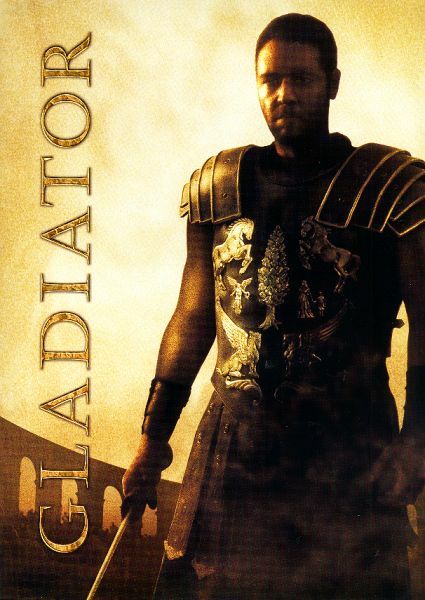 Gladiator is the tale of a hero, a man larger-than life. It’s beautifully filmed with a stunning score by Lisa Gerrard and Hans Zimmer. It’s also a tale of friendship, greed, ambition, loyalty and courage. 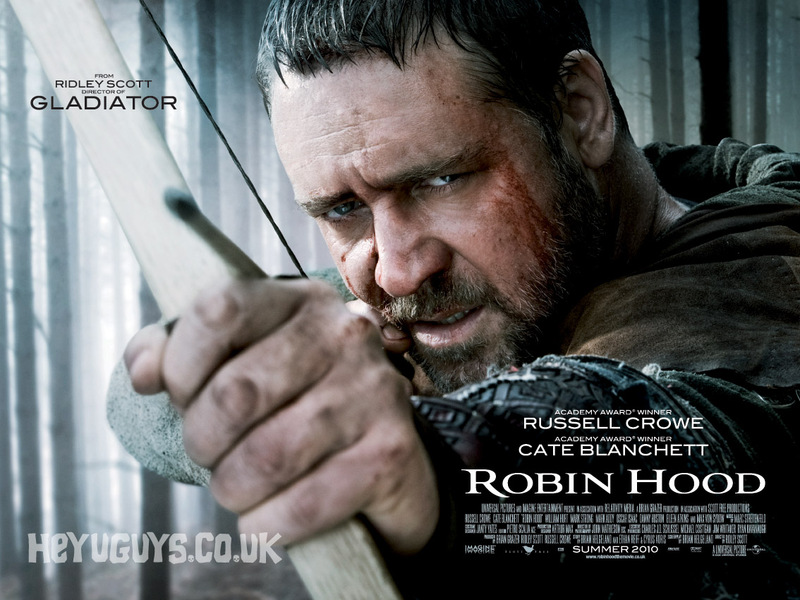 I’m not sure if this movie would be so great without Russell Crowe but I know that he was one hell of a great choice. And so are the other actors, among them Joaquin Phoenix, Connie Nielsen, Oliver Reed and Djimon Hounsu. The same that can be said about the actors can be said about the score. Not one of those large scale Hollywood prodcutions would work as well as they do without the music. In terms of emotions and entertainment, this is one of the most perfect movies for me. I watched the Hornblower series last year and enjoyed it very much. I re-watched Master & Commander and thought once again that it is really a good movie. Finally I discovered the Sharpe series with Sean Bean and I like it a great deal as well (at least those I have seen so far). Considering that they are all based on the Napoleonic Wars, I thought it might be high time to see what else there is. I found quite a few movies, some I have seen a long time ago, like Abel Gance’s Napoléon, and others that I still would like to watch. I also included movies on the man himself as I figured there will not be many biopics on Napoléon leaving out the wars. When I was a child I went through a bit of a Napoléon obsession and remember contemplating his wax figure at the Musée Grévin in Paris with awe. I should have been awed that even as a ten-year old child I wasn’t that much smaller. There are quite a lot of German and French productions of the topic. I did include them although not all of them have been subtitled. The movies that I would like to watch soon are Waterloo with Rod Steiger, the mini-series Napoléon and Ridley Scott’s The Duellists. As ususal any comments, additions or ratings are highly welcome. The Duellists is a movie I wouldn’t have known of, if it hadn’t been for Guy Savage‘s recommendation in a comment. 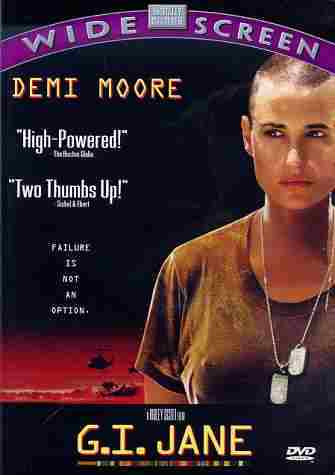 Ridley Scott’s G. I. Jane is an extremely entertaining movie. I just need to enumerate who’s in it and you might be tempted to watch it if you haven’t done so yet. Demi Moore, Viggo Mortensen, James Caviezel, Anne Bancroft. The story is interesting if somewhat implausible but certainly providing us with some food for thought about different things. Lt Jordan O’Neil (Demi Morre) is an ambitious young woman. She would like to climb the career ladder no matter what it takes. Being pretty sure this will need some combat experience she is willing to go the whole way. Only women aren’t really allowed to undergo combat training. Senator DeHaven (Anne Bancroft) is equally ambitious. Sensing that supporting the admission of women to the Army might boost her career she does everything to get permission to let a test candidate, G.I. Jane, undergo training. To make matters worse the people against her and this undertaking decide to choose the hardest possible training, namely the Navy SEAL training. The selection of the right candidate takes some time. Senator DeHaven doesn’t want a masculine looking woman, she doesn’t want a homosexual woman either as this could undermine the exercise. When she sees as picture of beautiful Jordan O’Neil, she knows, it is her and no other that she wants for this test run. What follows is one of those stories that show us how a resilient human being can fight even the most adverse circumstances, overcome weakness and prove her strength. Jordan undergoes the SEAL training and where many men fail, she excels. She makes it through the initial week and the following weeks. During this time she is closely supervised, challenged and in the end also brutalized by the Master Chief (Viggo Mortensen). Of all the boot camp bastards that we get to see in this type of training focused movies he is by far one of the most complex and interesting. Not just because he quotes poetry but also because he changes considerably and ultimately because he isn’t a bad sort at all. He has to be mean. Sure, there is this one scene in which he overdoes it but doesn’t he have his reasons? The movie shows 2/3 boot camp and 1/3 actual combat. This las part is highly fictionalized and serves mainly the purpose to show how worthy a soldier Jordan has become. The movie is a bit on the sentimental side and – yes – it is stretching quite a few things but I like it and have watched it before. I think Demi Moore was a terrific choice and it is one of Viggo Mortensen’s best roles. Also Anne Bancroft as a real b**** is great. Does it say much about women in the military? It certainly does look at the adversity a woman would have and does face, it looks at the prejudices and preconceptions. Jordan has to start to do it exactly like the men before she is only half accepted. It shows also that it isn’t only that men think women can’t do it but that men are constantly tested by the presence of women. Temptation as well as compassion play into it. Seeing a wounded female soldier might be harder to take than seeing a wounded man. And what If she has to rescue you and she is a slender woman while you are a big, bulky man, weighing twice as much? My top favourite scene is when a bunch of soldiers, one of them of African-American origin, discuss if a woman should be admitted to this type of training and the African-American soldier points out that his grandfather was only allowed a s a cook during WWII. It is obvious that the prejudices African.Americans had to face were similar to those women had and have to endure. Don’t watch it, if you are looking for answers, watch it when you want great entertainment and a probably very realistic look at the Navy SEALS training. I am left with quite a lot of questions. Are there women today in the Navy SEALS? Is it in any way a realistic movie or not at all? Why exactly did the Master Chief mistreat her like this?